The Book of Pentacles of the Shem ha-Mephoresh Angels. These pentacles have been sourced from “Clefs majeures et clavicules de Salomon” an French Grimoire. 1826, attributed to Eliphas Lévi . 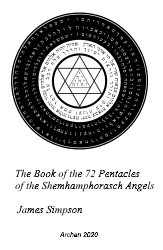 This is an interesting Grimoire as It appears that the angels listed in this Grimoire list the talismans aligned to the 72 names of God (Shem HaMephorash). The 72 Angels of God. In the Zohar (155 BC), the Hebrew Book of Splendour, it is said that God sent Archangel Raziel (aka Ratziel) with a book for Adam. This book was about the holy mysteries of the highest nature, the Holy wisdom of the 72 kinds of knowledge, virtue and power. In the Kabbalistic Tree of Life, these virtues were structured in nine groups of eight angels, which are ruled over by its own archangel. This eBook redraws the original pentacles of the grimoire and corrects obvious errors in their design and alignment. Gives you instruction on reproducing the pentacles, when to produce them and how to empower them. These chapters will guide you through the complete process.